Heather's Craft Corner: Christmas Baby Santa Booties Pattern - Now Available! 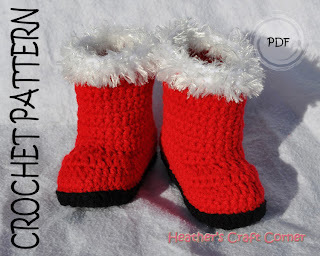 Christmas Baby Santa Booties Pattern - Now Available! They are easy to make and absolutely adorable when you're finished. They take about 2-3 hours to make. So, if you want a cute photo prop for you Christmas pictures or if you just want some festive baby booties, these are for you. You could also try a variety of colors to create some fun winter baby booties!